Peebles Originals, Your complete crystal radio site. "Radios That Work for Free"
This is my most, recommended book: Radios That Work For Free is a "How to" Book for all ages. This is the most comprehensive work of its kind. Not only does the reader get a new hobby but the skills necessary to continue in a science and art that needs revival. Projects found in this book can be built by the novice with assured success in every project. Also all the projects are especially adapted for "kitchen table construction." For those who have been waiting for something to fill their hands and to stimulate their minds, their search is over. Years of research and countless hours of experimentation have been accumulated to provide this broad base for the beginner. 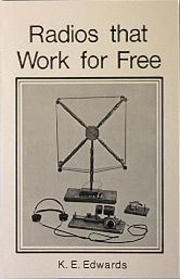 You will fill many hours building, listening and experimenting with "Radios That Work For Free"
#09-010, "Radios That Work for Free Book". . .$16.00 ea.